DIY Newlyweds: DIY Home Decorating Ideas & Projects: Christmas Already? This year the Christmas and holiday season seems to have started earlier than ever. I'm no longer surprised when I see Christmas decorations sold in stores in October, but this year I'm really surprised by how many homes are already decorated for the holidays. Traditionally, I've seen people start decorating their homes for Christmas after Thanksgiving, but this year there are at least 10 houses in my neighborhood already fully decked out for the holidays (and my neighborhood isn't very big). Nearby neighborhoods already have their sparkling lights, Santas, and animated deer already on display every few houses too. And I've barely gotten my Halloween decorations down! Is this happening in your neck of the woods too? I love the holiday spirit, but I must ask what happened to Thanksgiving?! Everyone seems to be skipping over it this year! (Although I can understand decorating for Hanukkah already as it starts on December 1st this year). I've always been one to wait until mid December, when it's really cold outside and I'm shivering in the snow, to put up my decorations. I would like to decorate earlier this year, but I'm still planning to wait until the start of December. I personally like to enjoy the moment and take the time to enjoy Halloween and Thanksgiving before skipping ahead to the next holiday. Am I being Grinch when I think Christmas should wait until after Thanksgiving? Or do you agree that it should be one holiday at a time, people! What do you think? 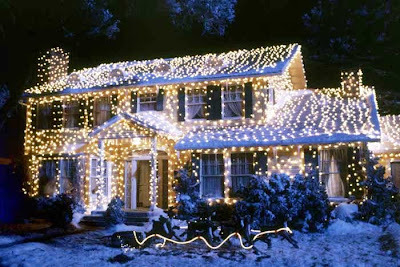 Does your house already look like the Griswold's? Or are you holding off your Christmas cheer until your bruises from Black Friday shopping heal? My harvest decorations are my favorites, and it seems like the season for them is already too short, so I always leave them up until the day after Thanksgiving. Having said that, I will admit that my husband and son have already hung the lights outside, but that is for a practical purpose--they need to get the lights up before the snow starts. We do NOT turn them on, however, until the day after Thanksgiving. That's when my Christmas wreath will go up, too.